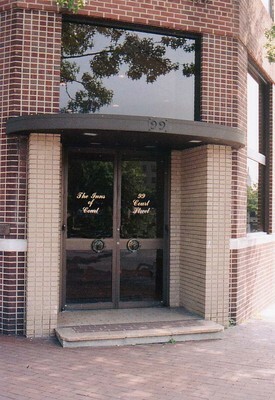 99 Court Street is the red brick building located on the corner of Court and Quarropas Streets. I-287 East to Exit 6 (Route 22/North Broadway). Follow directions "FROM EXIT 6" below. I-95 or Merritt Parkway to I-287 West towards the Tappan Zee Bridge I-287 West to Exit 6 (Route 22/North Broadway). Follow Directions "FROM EXIT 6" below. After Bridge Toll, follow signs to I-287 East towards White Plains/ New England; I-287 East to Exit 6 (Route 22/North Broadway). Follow directions "FROM EXIT 6" below. I-287 West to Exit 6 (Route 22/North Broadway). Follow North Broadway (Route 22) southbound. of the Metro-North Commuter Railroad. Trains run every 15 minutes during rush hour.